Ellis Marsalis launched his ELM Music in 2004 and it's in full flower now with these two releases. A well-rounded archive title becomes a suitable companion piece to a brand-new recording by the baby of the family who is slowly but surely staking out his own turf in the world of jazz. Young Jason Marsalis displays the same eloquence that runs in his family plus an unpredictable streak that will stand him in good stead as he progresses. In contrast to his previous drums/percussion labs‚ Music Update is a more conventional work with a band where he features himself on the vibes and in the roles of bandleader‚ composer and producer/recording artist. Disciplined to be sure (three tracks reference that character trait) but not structured to a fault‚ his greatest challenge may remain what direction to choose for each successive endeavor. Capturing an out-of-print session between two highly estimable figures of modern jazz‚ Ellis Marsalis and Eddie Harris‚ this is an expanded version of Homecoming. At the heart of this music is a robust blend of the formal and the gutsy‚ an accurate summary of the soul of New Orleans‚ where it was germinated and came to fruition. Most of its playing time is comprised of duets between the pianist and saxman. But this CD version also includes takes not included in original release; these recently recorded tracks with a full band provides pacing and imbue the reissue with a character all its own. 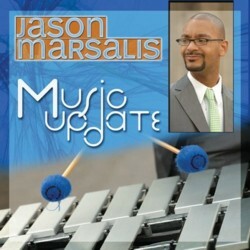 As with Jason's album‚ the liner notes expound upon the chemistry that makes the reading worthwhile (both Marsalis' supply their insight) and in turn enhances the beautiful mystery of the creative process that brought this music into being.